MARTINS FERRY — The Weir High softball team is back over the .500 mark after a doubleheader sweep on Saturday at Martins Ferry. The Red Riders (10-9) won the first game, 12-0, in six innings. Liv Rosnick went the distance and picked up the victory, striking out eight and walking one in the process. Offensively, she produced singles and three RBIs. The other Rosnick, Mallory, tallied a home run, three singles and three RBIs. Sophia Mikula also homered and singled three times. Taylor Webster had three singles and three RBIs, while Alexis Adams added a pair of singles and RBIs. In the second game, Weir High won 5-4. Sam Kaczmarek pitched the first five innings and got the victory. She struck out four, walked none and all four runs she allowed were unearned. Liv Rosnick got the save, striking out two hitters. At the plate, Mallory Rosnick doubled, singled twice and drove home a pair. Liv Rosnick had three singles again. Kaczmarek singled and drove home one. Mikula and Bella Aperfine each had a double. The Red Riders host Big Red on Monday before leaving for a tournament in Tennessee the following day. WEIR HIGH (9-9): L. Rosnick (wp, CG, 2BB, 8K) and Mikula. MARTINS FERRY: Boyer (lp, 1IP, 1R, 2H, 1BB, 0K), Bumbico (4IP, 7R, 12H, 2BB, 2K), Clark (1IP, 4R, 4H, 2BB, 1K) and Pollock. TWO OR MORE HITS: Weir High (Mikula 4, Webster 3, L. Rosnick 2, M. Rosnick 4, Angus 2, Adams 2); Martins Ferry none. DOUBLES: none. TRIPLES: none. HOME RUNS: Weir High 2 (Mikula, M. Rosnick). RBIs: Martins Ferry none; Weir High (Mikula, Webster 3, L. Rosnick 3, M. Rosnick 3, Adams 2); Martins Ferry none. WEIR HIGH (10-9): Kaczmarek (wp, 5IP, 4R (0ER), 5H, 0BB, 4K), L. Rosnick (sv, 2IP, 0R, 1H, 0BB, 2K) and Mikula. MARTINS FERRY: Bumbico (lp, CG, 5R (4ER), 0BB, 1K) and Pollock. TWO OR MORE HITS: Weir High (Webster 2, L. Rosnick 3, M. Rosnick 3); Martins Ferry (Funkhouser 2). DOUBLES: Weir High 3 (Mikula, Aperfine, M. Rosnick); Martins Ferry 1 (Bumbico). TRIPLES: none. HOME RUNS: none. 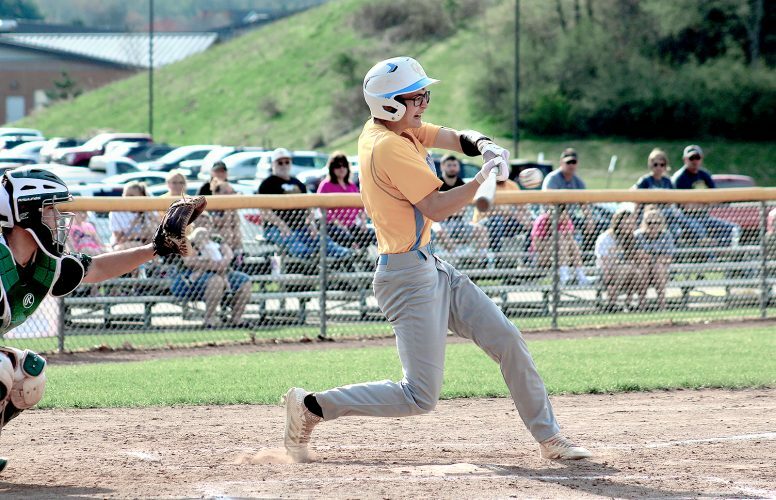 RBIs: Weir High (L. Rosnick, M. Rosnick 2, Angus, Kaczmarek); Martins Ferry (Sidon). STEUBENVILLE — The Big Red softball team split a tri match on Saturday at the Franciscan University of Steubenville softball field, defeating Wheeling Central, 11-8, and falling to Poland, 6-4. Against Wheeling Central, Sammi Cucarese had three hits and four RBIs, while Mary Marshall had a home run and four RBIs. Stef Mikel Blackburn had two doubles and two RBIs, while going the distance in the circle for the win with four strikeouts. Against Poland, Lakyn Blackburn had two hits, including a home run, and two RBIs. Madison Fields struck out four, allowing six runs, two earned, while going the distance. WHEELING CENTRAL: Lematers (LP, 6IP, 11R, 7ER, 1K, 4BB) and Thomas. STEUBENVILLE: S. Blackburn (WP, CG, 8R, 4ER, 10H, 4K, 1BB) and Carducci. TWO OR MORE HITS: Wheeling Central (Baylor 2, Ferns 2); Steubenville (S. Blackburn 2, S. Cucarese 3, L. Blackburn 2, Fergsuon 2). DOUBLES: Wheeling Central 1 (Comfort); Steubenville 3 (Cucarese, S. Blackburn 2). TRIPLES: none. HOME RUNS: Wheeling Central 2 (Davidson, Vorgin); Steubenville 1 (Marshall). RBIs: Wheeling Central 7 (Thomas, Ferns, Davidson 3, Vogrin); Steubenville 11 (S. Blackburn 2, Cucarese 4, Marshall 4, Banks). POLAND: Wire (WP, CG, 4R, 3ER, 3K, 1BB). STEUBENVILLE: Fields (LP, CG, 6R, 2ER, 10H, 4K, 1BB) and Carducci. TWO OR MORE HITS: Poland (Gross 3, Wire 2, Nittoli 2); Steubenville (L. Blackburn 2). DOUBLES: Poland 3 (Gross 2, Lattanzio); Steubenville none. TRIPLES: none. HOME RUNS: Poland 1 (Gross); Steubenville 1 (L. Blackburn). RBIs: Poland 3 (Gross, Nittoli, Sienkiewicz); Steubenville 4 (S. Cucarese, L. Blackburn 2, Banks). ELM GROVE — The Brooke softball team reached the double-digit win mark by defeating Magnolia, 4-1, Saturday at the I-470 complex. Maleaha Misch went the distance in the circle for the win with eight strikeouts and no walks. Carli Julio had two doubles and an RBI, Landyn Haynes a double and two RBIs, while Brooke Ohler had an RBI for the Bruins. Brooke plays at Indian Creek on Tuesday. BROOKE (10-7): Misch (WP, CG, 8K, 0BB) and Veltri. MAGNOLIA (10-3): Tharp (LP, CG, 3K, 3BB) and Fluharty. TWO OR MORE HITS: Brooke (Julio 2, Cross 2); Magnolia none. DOUBLES: Brooke 3 (Julio 2, Haynes); Magnolia 1 (Brill). TRIPLES: none. HOME RUNS: none. RBIs: Brooke 4 (Haynes 2, Ohler, Cross); Magnolia 1 (Whitman). TORONTO — The Toronto softball team swept a doubleheader on Saturday, defeating Southern 10-7 in the first game and 12-5 in the second. Jamie Anderson was the winning pitcher in both games, pitching the final two innings in releif in the first game with three strikeouts for the win. She started and went the distance in the second contest, striking out eight. She had a big day with the bat, too, with three hits, including a triple, and an RBI in both games. Lexi Thomas had two singles in each game. Kiara Smith had an RBI in the first game and four RBIs in the second. The Red Knights, now 9-3, are at Lisbon on Monday. SOUTHERN: Michael (LP, 5 1/3IP, 7R, 9H, 4K, 1BB), Felton (1 2/3IP, 3R, 3H, 0K, 0BB) and McCulley. TORONTO: Kinsey (5IP, 7R, 5ER, 7H, 8K, 2BB), J. Anderson (WP, 2IP, 0R, 3K, 0BB) and Sapp, Price, Reed. TWO OR MORE HITS: Southern (Berta, McColley); Toronto (Thomas 2, J. Anderson 3, Kinsey 2, Merideth 2). DOUBLES: Southern 1 (Berta); Toronto 2 (Kinsey, Meriedeth). TRIPLES: Southern 1 (Boyle); Toronto 1 (J. Anderson). HOME RUNS: none. RBIs: Southern 4 (McCulley 2, Felton, Berta); Toronto 7 (Liddick 2, Merideth 2, J. Anderson, Kinsey, Smith). SOUTHERN: Felton (LP, 6IP, 12R, 9ER, 12H, 6K, 4BB) and Berta. TORONTO (9-3): J. Anderson (WP, CG, 5R, 3ER, 6H, 8K, 1BB) and Reed. TWO OR MORE HITS: Southern (Felton 2); Toronto (Reed 2, Thomas 2, Anderson 3, Smith 2). DOUBLES: Southern 1 (Felton); Toronto 2 (J. Anderson, Price). TRIPLES: Southern 1 (Boyle); Toronto 1 (Reed). HOME RUNS: none. RBIs: Southern 4 (Felton 2, Boyle, Michael); Toronto 7 (Smith 4, Reed, J. Anderson, Price).